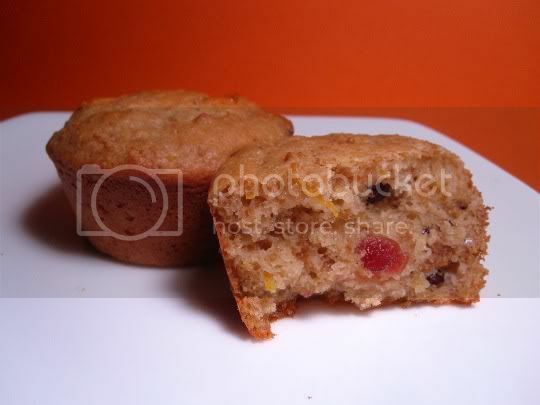 The classic combination of cranberry and orange is usually great in any baked good or other dish...but these muffins just weren't what I was expecting. I'll start with the good: they're easy to make, super moist and fluffy, full of orangey flavor, and the bursts of cranberries are quite a delight. But now the bad: they're barely sweet, and the "bran" in the recipe makes the muffins taste a little too healthy. Now some of you may be thinking, "What's wrong with that?" The answer, nothing...but the bran flakes (yes, whole bran flakes are used in the batter, but are softened by the liquid ingredients in the recipe) paired with whole wheat flour in the batter makes these a little too hearty. In fact, I'd go so far as to say there's almost a bitter aftertaste. The sweetness (or lack thereof) comes from honey and orange juice, but it almost tastes like there's a missing 1/4 cup of sugar or something. The recipe also suggests that 17 muffins are yielded, but I got more like 15. Make again? Probably not. I'll be eating this batch, but there are other cran-orange recipes I'd rather try. Hey, at least these are fiber-rich! Vegan variation: Use soy yogurt, vegan butter substitute, egg replacer, and honey substitute (if desired).